This traditional hand woven Palm leaves and bamboo hat is very unique to Thai culture. Females use this hat to protect sun and rain while are at home or working out door especially in the farm or garden. Males also use this hat on the same purpose. This hat is very comfortable and efficiency in protecting sun because the wide brim widens protecting your face, neck, chest to your shoulder. It is the most practical form of blocking the sun. The hat has a flexible/expandable bamboo head ring inside that keeps the hat on your head and lets air circulate keeping your head cooler than any hat you have ever worn. You can wear this hat at the beach or in the garden or while working out door. The hat comes with 2 pieces, the hat body and the head ring. The head ring is tied to the hat body with wire or bamboo stripe or yarn or string or twisty for tying the trash bag. This head ring sits on one's head to secure the hat to the head, and which allows for a space between one's scalp and the hat itself. This nicely allows for air circulation between one's head and the actual hat. Hat size is ...The head ring is one size fit all. It will expand when your head is bigger, but it will not hurt your head. 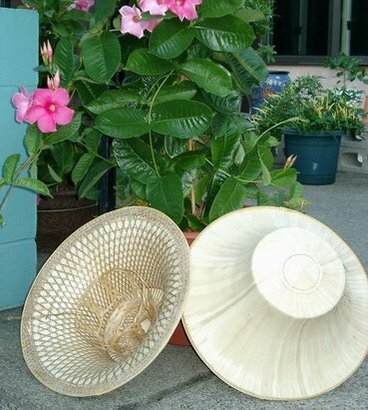 These hats were made by the villagers in Arng-Thong town of Ayutthaya province in Thailand. Thai farmer hats were worn in The Bridge on The River Kwai movie. If you have any questions about this product by Thai Style, contact us by completing and submitting the form below. If you are looking for a specif part number, please include it with your message.